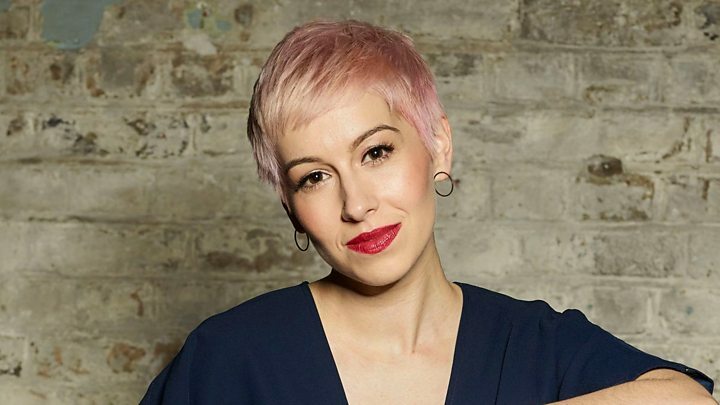 The Eurovision Song Contest is almost upon us and the UK's entrant SuRie will already be limbering up in Lisbon ahead of Saturday's grand final. Some of the UK's former competitors have spoken about their Eurovision experience and what their favourite memories from the show were - even if the vote wasn't kind to them. BBC News spoke to six of the UK's previous Eurovision acts and found out what advice they would give to SuRie. Lucie Jones was last year's UK entry, coming a respectable 15th out of the 26 countries which competed in the final. She sang Never Give Up On You and says she was "amazed" at how supportive the Eurovision fans are. At the end of the show, I had a big bag of glitter and was throwing it over everyone. Everyone took it really well - except Greece. She didn't take the glitter very well at all, because she thought she was going to win. She thought I was making fun of her and didn't take it in the spirit in which I meant it. Image caption Blue's 11th position is the UK's best most recent result at Eurovision. Blue already had a huge chart-topping career including collaborations with the likes of Elton John, Stevie Wonder and Lil' Kim. The boyband used their 2011 Eurovision appearance as a comeback after having been on hiatus for seven years. Blue's song I Can came in 11th place at Eurovision - which hasn't been bettered by the UK since. It was something I loved as a kid. I remember watching Making Your Mind Up by Bucks Fizz - I thought it was great. I was only 10 years old at the time, but it had a real lasting impression on me. Ours wasn't on the spectacular level it is now. It was much more basically staged. I appeared on Terry Wogan's Saturday night programme over a number of different weeks to showcase all the different songs which were options for Eurovision. All the music industry people and all these high level BBC executives picked out these eight songs as possibilities. Simon Cowell was among those involved, I was signed to him at the time. Image caption Yes, we know... Sonia came second. There has always been a lot of interest in Eurovision from famous songwriters. Pete Waterman wrote one, as did Andrew Lloyd Webber. Songwriters have always been really interested in competing as it's a great stepping stone to getting your song heard by a massive audience. At the time I was completely devastated because I came so close to winning. If I'd have come 10th, I don't think I'd have minded so much. Stay focussed - she's a pro, so she's no stranger to a stage. Go for it and enjoy. Why is Oz's answer to Beyonce doing Eurovision? It's crazy that I did it. It's the biggest singing competition in the world and we were lucky enough to perform and represent the UK. How many A-list celebrities can say they've performed in front of 250 million people? Getting the chance to do it was just fantastic. I'd love to go back and try again. It was such an experience and the audience was immense. In the jury vote we didn't do too badly - we got 12 points from Malta fairly early on, and some of the other countries awarded us points too. So it was looking OK, but then the televotes got added to the scores and we were just annihilated. I think changing the voting system worked - it just didn't work in my favour. It's a good thing though - it's all about entertainment at the end of the day. It's the perfect Eurovision song, but I can't see it winning. My advice to SuRie would be to remember to remember. It's so easy to go up on there and just go for it, and then forget it all. Andy first came to our attention after coming runner up to Shayne Ward in the second ever series of The X Factor. He travelled to Belgrade in 2008 to compete in the Eurovision song contest, but came last place. Perhaps this explains why he has "mixed feelings" about his time in the competition. I have mixed feelings, I love the competition and how historic it is but it needs a overhaul in regards to the voting system. I wish the competition was fair for every country with no bloc voting. I have three, performing my song Even If to millions, working with the legend Terry Wogan, and getting the thumbs up from Jean Paul Gaultier. I can't remember specific countries but I do remember (I think Azerbaijan) when we had all the entertainers at an event, they had about 30 paparazzi chasing them, then I heard the paps were paid as a PR stunt. My advice to SuRie is enjoy the experience, and don't have too much expectation on where you end up. Image caption Nicki French says she would do Eurovision again "in a heartbeat"
After her UK chart success in 1995, Nicki French performed at Eurovision in 2000. She says it took a long time to get over what was, at that point, the UK's worst ever placing. What was the best thing about doing Eurovision? The show itself. And having make-up people, cameras and stylists all around you. I'd love to be able to re-do it and relive it - it was just the best experience. I would do it again in a heartbeat. All the vocals have to be live on the night. People laugh at it, but there's no other show where everything has to be absolutely live. Considering it's live TV, it's amazing more stuff doesn't go wrong. The year we did it, it was the first time the internet was streaming it, so we were told there was up to a billion people watching! I was so nervous, pacing around backstage, but when I walked on stage it felt like a dream. Backstage, there were just curtains to partition each dressing room area. I'd gone to our UK area, and I could hear someone next door singing our song, playing it on guitar. It was the German entry, Stefan Raab, just sat singing my song - I was really touched. What did you make of your result? I came 16th out of 24 which was the worst we'd done ever at that point. It meant so much to me and took me some time to get over it. Everyone was really kind, telling us we shouldn't have been so low. I felt the performance had gone well - we watched it when we got back and still didn't know what had gone wrong. It followed on from the British beef crisis - so I don't know if it had something to do with that, but it was painful - you really feel like you let the country down. The one who really takes it very seriously and goes hell for leather is Sweden. The Eurovision final is the most watched programme in Sweden, I believe. Russia definitely like to go for it too. When you get out there, you can't prepare for it. It's unlike anything you've ever done before. I'd been on stage in front of 50,000 people before and I still wasn't prepared. Just savour the moment, because it is gone in a flash. It's the most enjoyable thing to do. I'm sure she'll be fine though. Media captionIt's not SuRie's first time taking part. So why does she keep coming back?